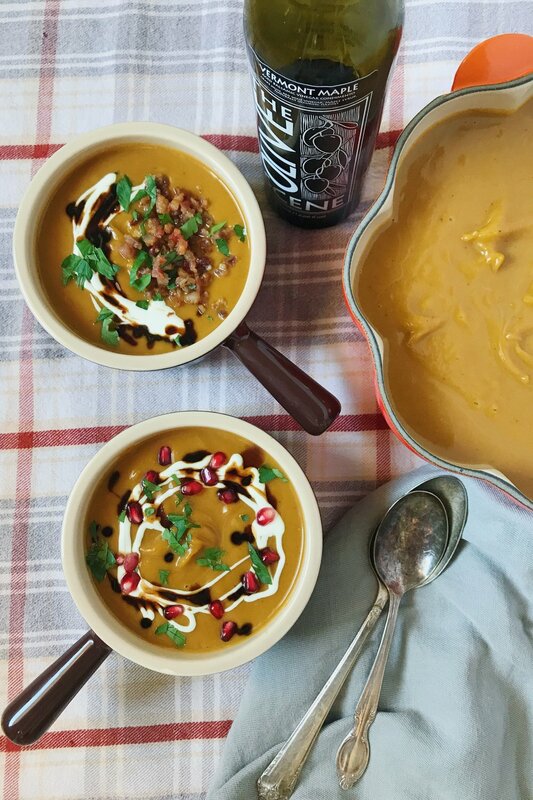 This savory/sweet squash soup with Maple Balsamic Vinegar and fall spices is a healthy meal that can easily be made vegan or vegetarian. It’s simple enough for a weeknight, but also makes a beautiful addition to a holiday table and can be prepared ahead of time then simply reheated before serving. This soup also makes a lovely appetizer when served in small punch glasses or ramekins. To roast pumpkins or squash, poke holes in them using a fork or knife then microwave for 3 minutes. Cut in half and remove the seeds and pulp. Coat the inside with olive oil and season with salt and pepper. Place cut-side-down on a baking sheet and roast at 350 degrees for 40-60 minutes, until squash is very soft and can be scooped out of the skins. Make a balsamic reduction by heating the Maple Balsamic Vinegar in a small saucepan over medium heat. Bring to boil and reduce to a simmer. Cook until balsamic is reduced in half, about 3-5 minutes. Watch closely so it doesn’t burn! Heat the olive oil in a large pot over medium heat. Add the garlic powder, ginger, cinnamon, nutmeg, and clove. Stir well for 30-60 seconds, until fragrant, to allow spices to bloom. Add the brown sugar, coconut milk, water, and 1.5 tablespoons of the balsamic vinegar reduction. Increase heat to high and bring to a boil. Add the squash and stir well to combine. Turn off the heat. Use an immersion blender or a blender to puree soup. If using a blender, let soup cool down before blending. Add more water, stock, or coconut milk until it reaches the desired consistency. Taste and add salt and pepper. Depending on how sweet your squash is, you may want to add more sugar as well. Serve warm with whatever toppings you choose!